Peter Saunders was the one who came up with the idea for this album and was instrumental in obtaining funding (through a proposal) from the President’s Discretionary Fund. We originally wanted the album title to be “Absolut Saints” and envisioned a cover using the group’s photo together with an illustration involving a bottle of Absolut vodka (inspired by the very popular ad campaign). 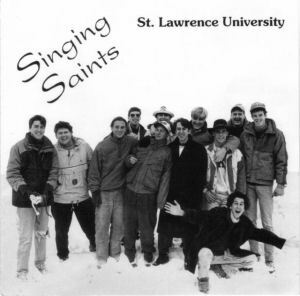 The cover photo was taken behind Vilas Hall (the Beta Theta Pi house is behind us) against a white, snowy background. By having as little background as possible, the designer could easily mesh the illustration with the photo. (If you look closely you can see where the background was cut out.) However, after the photo session was completed we decided against such a flagrant trademark and copyright infringement and as a result, ended up not with a full-color concept cover but rather with a black and white image against a white background and a black and white booklet. Both exterior shots in the booklet (the other in front of Sykes Hall) were part of the same shoot, in the middle of the day, making some of us late for our afternoon classes. (Except for Brian Keogh ’94 who wasn’t in the shots.) The rest of the photos were taken during a rehearsal in Griffiths Hall Room 15, but I don’t know who the photographer was. I remember that we decided to make the “Compact Disc” logo on the disc label gold—in part because our rep at Digital House seemed to indicate it had to be–only to find out later that a second color on the label cost more and it was too late to change it.